Did you ever want to take a tour of the Fernet Branca production facility in Argentina? Well, this TV program has you covered. In Spanish. Recently, I taught a university course aimed at young students wanting to learn more about wine, and I was shocked to discover that no one in attendance wanted to argue about "Natural Wine". In retrospect, it would seem that wanting to learn about wine comes naturally, but the desire to argue about it is something we have to be taught to find. Perhaps there are other ways to talk about the subject that aren't explosive and defamatory. I know this last point sounds incredible, and you may not even believe it, but my own attempt to do so was recently recorded and I can share it with you . I think it is possible to have this conversation intelligently and even humanely. Several times before in his long career has this Sommelier walked out to the gueridon to take on a fast paced nine pm seating and the possibility of turning in a no tca night. But on this day, April the fourth, two thousand and -twelve, he makes the toughest walk of his career, I'm sure, because through eight hours he has uncorked a perfect evening. He has 86'd not one wine, while retiring 56 consecutive cork stoppers, and the first table he will look at is the Palliottis', big time regulars from the neighborhood, who last time around lofted a Chablis order into deep three figure territory, before grinding out a Priorat with steaks in deference to their guests. The Sommelier wines up, and delivers: curveball for a strike. Cepas Vellas Albarino from the high pergolas of Galicia, and they love the idea. "0" and one the count to Mr. Palliottis, his wife, and his son. On deck at the far booth is Mr. Bruce, a stickler for fine Bordeaux. Here's the strike one bottle presentation to Palliottis, Sr.: a low-hanger that sweeps in under the nose and stays there, seemingly forever, until Palliottis nods it by. Dalton lifts his Laguiole holder and straightens his jacket before fussing with the dark capsule. Palliottis must feel the pause as he lays into his seat back, heaves a hunk of Echire towards his bread plate, and takes a few practice swings with his butter knife. Shariff is over to the right with the water pitcher, about to step in, but Dalton waves him off as he goes thru with the white. The count is at 2 strikes. Palliottis tries a go at the glass but Dalton hasn't finished yet, a pause, a lift, and Palliottis almost takes one on the chin as he pulls up too hard and lofts the liquid into space, past his nose, up almost to the lights. A foul ball and Dalton must regroup as several players rush in with napkins to contain the spill. Palliottis seems shaken but undeterred. Two strikes again and it is 9:21 p.m. on April the fourth. The oh-two pitch is on the way and it is a fastball, right in the middle of the glass, as Dalton seems to want to get out of this one as quick as he got in. The defense in this spine-tingling moment: Dalton and Mr. Magic. The boys who will try and stop any empty glasses from blocking the way: Abdul, Shariff, Elcasir, and Chang; and in the coffee station Francesca is keeping the burners warm. And there's twenty-nine thousand people in the blog audience and a million butterflies. Twenty nine thousand, one hundred and thirty-nine folks who used google to get here. Dalton backs off the rubber of the table leg mounting, then goes back in and toes it. The bartender strains to get a better look as he stares through the dead soldier magnums lined up one next to the other on the bar counter. Oh and two is the count to Palliottis as he leans in for a whiff, and the entire Crowd inhales. A lot of people in the audience now are starting to see the pitches with their hearts. The Albarino was outside the defined zone, sure you could say it was similar to Chablis in a way, but some experienced umpires wouldn't go for it. Maybe a previous Priorat order says Palliottis is a fan of Spain, and maybe it doesn't. Dalton, reading signs, waits and waits and takes his cues. Big Palliottis goes for it! Dalton has struck out another baller! He is two tables away from a perfect game! Here is Mr. Bruce to pinch-hit for Kellinger, who usually has this table on this evening, but has declined tonight on account of his trip to Southern California, San Pedro. Bruce is a Giant. He's been around the block of the 1855 classification roster, and as we mentioned earlier, he has helped send two bottles back in the past. On deck is Ricky Colline. The pitch, a 1995, a strike and Bruce seems all ears to the call. He is taking it all in. The wine up and there is the move to the Left Bank that might have been expected here, in this year. Strike two. Dalton reading, and the third pitch is out and Bruce lets it go by. There will be no Margaux for him this evening. One and two. Bruce looks away and speaks to his guest for a moment, shakes his napkin a bit. And Dalton with a new gambit tries to draw back Bruce's attention, hitching his hand up a bit higher on the list. Bruce is back in the box, and I'll be damned if maybe, just maybe Dalton doesn't have him right where he needs him as YES, Bruce goes for the Leoville deep in the count. I would think that the sommelier gueridon right now is the loneliest place in the world. Dalton pausing, looking to regain his calm, thinking of the softer sun in Provence perhaps, he is one out away from the promised land, and Mister Ricky Colline is comin' up. So Ricky Colline is at bat in the bar seats, filing his order with the tender. The time on the scoreboard is 9:41. The date, April the fourth, two thousand and twelve, and Dalton working on the veteran Colline. 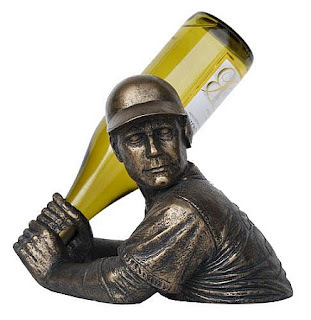 Levi into his wine up and the pitch, a fastball aperitif by the glass for a strike. He has struck out, by the way, five consecutive tables, and that's gone unnoticed. Dalton ready and the strike one pitch: very high, and he lost his serviette. He really forced that one, trying to get Colline to go for the White Burgundy. That's only the second time tonight where I have had the feeling that Dalton threw instead of pitched, trying to get that little extra, and that time he tried so hard his serviette fell out of his hand, he dropped it — it's an extremely long stride towards the white on the floor — and Elcasir has to go up and retrieve it. One and one to Ricky Colline. Now he's ready to do something: Chave White is rejected, and it's ball two. You can't blame a man for pushing just a little bit now. Dalton backs off, fingers his cellar keys, runs his left index finger along the lowboy skeleton piece, and then along his lapel pin, maybe looking to these for guidance, for support. All the while Colline just waiting. Now Levi looks in and over his shoulder, back to the list. Into his wine up and the two-one pitch to Ricky: and goes for it, Santorini, strike two. It is 9:46 p.m.
Swirled and sipped, a perfect game. On the scoreboard in the kitchen it is 9:49 p.m. in the City of the Apples, Big Ones, New York, New York. And a crowd of twenty-nine thousand one-hundred thirty nine just sitting in on their google readers to see this sommelier hurl four no-taint, no-premox games. He has done it four straight years, and now he caps it: On his fourth no-taint he made it a perfect game, no 86's. And this sommelier, whose name will always remind you of New York Rye Bread and maybe Denim Jeans, he did it with a flurry. He retired the last 59 consecutive cork holders. So we all know when he wrote his name in capital letters in the record books, that "L" doesn't just stand for LUCKY. Finding new wines is the easy part. Introducing delicious wines to the staff is no big problem. But putting those wines on the list, going line by line and making sure everything is spelled correctly and presented just right, well, that requires some music to keep things flowing. Whether you rock the headphones during the afternoon when the office is full of reservationists, or stay late to get the run of the place and max the speakers, good tunes are an important component of any list alteration. No bass line? No harmonizing? Then no successful wine program, and it is as simple as that. Knowing how important the right tunes are to a wine list update, I've decided to go ahead and share with you some of my very favorite music to change the list by. One of the greatest live performances of all time, and I challenge you not to sing along when it is playing, whoever you may be. This is my go to on those long overnighters where you have to input all the inventory numbers and then go ahead and change several pages of the list as well. Those nights where there is some crazy good party going on that you can't be at. The nights when you are stuck working and you don't want to be. Man, this song just washes over everything the way they sing it in this performance. I don't know of a better working man's catharsis than this song. HIT IT!! This is my unofficial wine list MANTRA. You don't like Gravner? So what, I don't care! I got a real funky concept: don't cheer me, just hear me out! I'll tell you what, this jam changes everything any time and anywhere you play it. Situation different, right about now! You need an extra lift to pull you through a 14 hour shift and make that wine list poppin'? Then this is your music. Listening to this will guarantee a list that flows. 1-2-3 Get loose on the list now! It truly does take two: this song and you. The ecstatic nature is of this, well, whatever it is, is just freakin INSANE. I mean, if I could ever lead a wine tasting that went anything at all even remotely like what happens in this video I think I would just retire right then and there afterwards. No more wine, no more dinners, that would have been it, the pinnacle. Another plane of existence. I get so excited when I am just watching this video that I can't sleep afterwards. I feel an incredible sense of urgency to run, to jump, to type out lines and lines of text spiralling off into forever. MAGIC. MUSIGNY. I don't even like Tiesto. But this one video, I mean, it's just nuts. the Amari file: the earliest vermouth? During Dynasty 0, around 3150 BC, one of the first kings of Egypt, Scorpion I, was buried in a magnificent vermouth cellar. "More than a thousand prescriptions are recorded in the ancient Egyptian medical papyri. Most numerous are those that list alcoholic beverages–wine and beer–as dispensing agents, and in which tree resins (terebinth, pine, frankincense, myrrh, fir, etc.) and numerous herbs (bryony, coriander, cumin, mandrake, dill, aloe, wormwood, etc.) are added ingredients. The plants and their exudates were macerated, mixed together, and steeped in these beverages; they were administered for specific ailments. Traditional Egyptian medicine today still uses many of the same formulations." -Patrick McGovern, "Wines Fit for Kings and the Afterlife"